Looking out, I spot plum-headed, pistachio-green parakeets, nibbling nectar from bottle-brush flowers, which they discard, creating a carpet of pink debris all over the ground below. But where is the shrieker? Keen to learn what bird my assailant is, I wander across the Basunti gardens and meet David. He’d been busy baking loaves of bread since 4 am. With a knowing smile, he informs me that my assailant is the “brain-fever bird” (Asian Koel;) the very beast that drove the British colonials to distraction. With a cup of tea in hand, I gather up my yoga mat, bolster and cushion and join my group on the rooftop. This is where our day begins, with meditation, stretching, Kriyas and the chimes of silence, the morning sun on our skin, the cool breeze in our hair, and the birdsong. Kites circle overhead and sometimes swoop down through the trees to drink from the water bowls. From here we can see fishermen rowing their boats silently across the lake. Indeed: “learning to let go,” that’s what we’re here for. In the distance, when the view is clear, we marvel at the soaring snow-capped peaks of the Himalayas, reflected in the water of the lake. 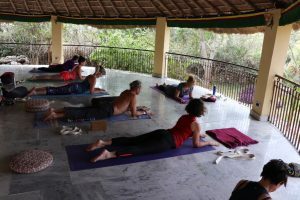 Into our second week we feel our shoulders, chest and pelvis unfurl without the usual stiffness, a bit like the petals of lotus flowers, opening up. When we lead with our breath our postures feel light and effortless. I am grateful to Anne for choosing me to share this #yoga retreat with her. Thank you Izzy and David for the slice of serene tranquility on earth that is Basunti. I hope this account gives you a flavour of yoga in the district of Himachal Pradesh, India. By Steve Bateman, April 2018 – thank you Steve.